Supplied to Anthony Ashley-Cooper, 4th Earl of Shaftesbury (d. 1771) for St. Giles's House, Dorset, and by descent at St. Giles's. These pier glasses, with nymph-headed tablets and richly-sculpted Roman acanthus, would have been commissioned by Anthony Ashley-Cooper, 4th Earl of Shaftesbury (d. 1771). On his coming-of-age in 1732, Lord Shaftesbury immediately set about the aggrandisement of his Dorset mansion, which had been built by Anthony Ashley-Cooper, 1st Earl of Shaftesbury (d. 1683), Charles II's Lord Chancellor, and aimed to transform the interior in the Roman villa fashion of Andrea Palladio and Inigo Jones. These 'Roman' pier glasses have their patron's coronet displayed on satyr-masked cartouches within their triumphal-arched 'temple' pediments, while Arcadian nymphs appear in the cornices of their reed-gadrooned frames, which are festooned with oak. Their robust architectural form corresponds to the 'National' or 'Modern' style of the early l8th Century, and in particular to Roman 'tabernacle' patterns after Inigo Jones (d. 1652), that Batty Langley issued in his Treasury of Designs, l740. The fine quality of their carving may indicate that they were executed by John Boson, a celebrated specialist carver employed by both Frederick, Prince of Wales (d. 1752) and Richard Boyle, 3rd Earl of Burlington. Shortly before his death in 1743, Boson is recorded as receiving a large payment of £128 in the Earl's Household Accounts. A related mirror frame belonging to the Worshipful Company of Goldsmiths is illustrated in O. Brackett's An Encyclopaedia of English Furniture, 1927 (p. 185). It is interesting to note that in the 4th Earl's account books, there are two payments to a Mr. Swan for glass, one dated 25 October 1734 for £18 1 6d, and one dated 22 October 1735 for £18 18 6d. Under the heading 'Extraordinary Disburstments for the House and Gardens 1735', there is a further record of payment to 'Swan, for Glass as per Bill...£18 1 6d'. It is likely that these payments are for the windows of St. Giles's, although the possiblility remains that they are for the mirror plates. The same account books also record a payment, dated 22 October 1735 'Paid as per bill to Mr. Gibson for Furniture - - £295 0 0' a considerable sum in those days, given William Hallett's bill of £167 for 'carved chairs' (see lot 40, Christie's King Street, 8 July 1999). It is likely that Mr. Gibson is the upholsterer Christopher Gibson of St. Paul's Churchyard, whose trade card shows the interior of his shop with various items. 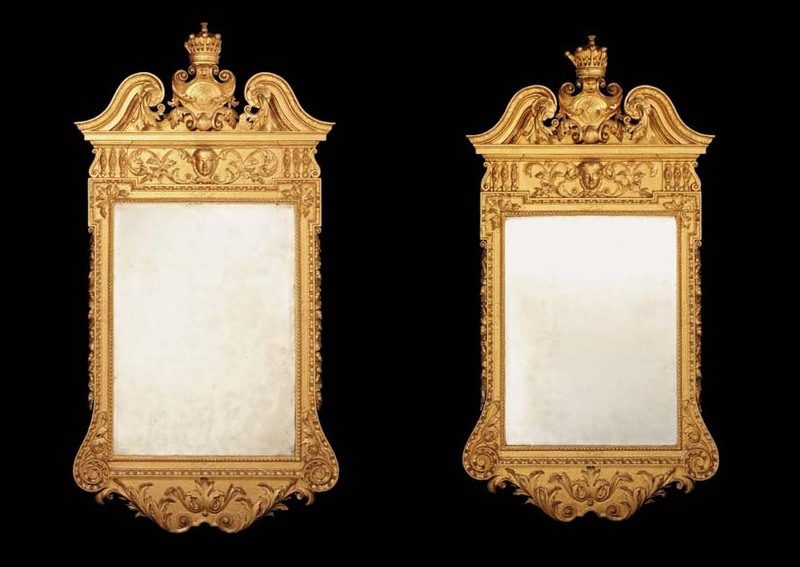 Analysis of the mirrors reveals that they have both been gilded three times, and patched once. There is the original water gilding, followed by patching in water gilding, then a layer of oil gilding, followed by a final layer of oil gilding. Before the application of the last oil gilding, the second and third layers were partially removed.